1. Experience with Group Home Furniture. 2. An Ability to Manage Both Quantity and Budget. Unlike homeowners, it’s not very feasible for group living facilities to buy furniture one piece at a time. Many group living professionals need to order furniture in larger quantities on a budget. While local retailers can struggle with bulk orders, quantity is not a problem for contract furniture sellers.Quantity isn’t the only hurdle for group homes. Buyers often have a furniture budget as well. 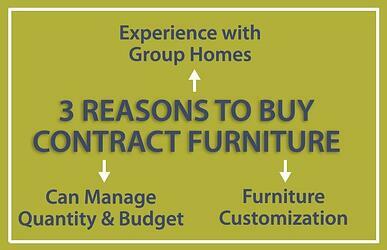 Contract furniture sellers can work with you to find solutions that work with both your budget and your needs. Design consultants can give you advice on furniture options that can serve your patients without breaking the bank at the same time. With a local retailer, what you see may be what you have to get. That isn’t the case with a contract furniture seller. Group home buyers can customize their selections online. This allows you to pick and choose different benefits for your furniture. This includes thousands of contract furniture fabrics that can add special benefits such as fluid and bacterial resistance. You can even see what these fabrics will look like with our 3d fabric visualizer.Group living facilities need more than standard options. They need solutions that are made with their patients in mind. Furniture Concepts can help. Start your very own Wish List today to get a price on the furniture you need for your group living facility. If you have any other questions, contact Furniture Concepts online or give us a call at 800-969-4100 today to learn about how we can best serve your consumers’ needs.